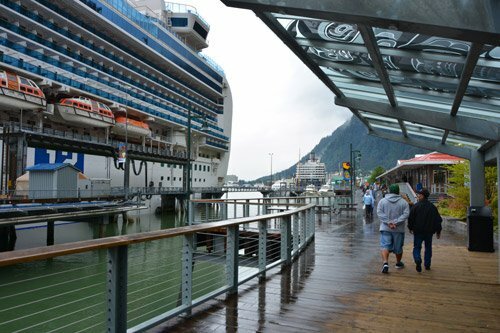 Our Juneau cruise port guide gives you information about the docking location, cruise dock, transportation options and much more! Welcome to the Juneau cruise port guide. Juneau is the smallest state capital of the largest state of the United States: Alaska. It is the gateway to the glaciers, wildlife and nature. Perhaps it’s even the best port of call in Southeast Alaska. The town is surrounded by the inter coastal waterways, by the Tongas National Rain Forest and the glaciers from the Juneau ice field. It is also know as cultural and transportation hub and this makes it the heart of Southeast Alaska. Back in the days Juneau was called Dzantik’i Heeni (meaning Base of the Flounder’s river). When in 1880 Richard Harris and Joe Juneau found gold at the mouth of the Gold Creek, the rush was on. Soon miners, saloons and missionaries would create the community of Harrisburg that would later be recalled Juneau. According to local legend ofter Joe Juneau bought a few rounds the night before the vote. In 60 years Juneau would export 150 million worth of gold, that would be 7 billion US dollar today. Wether you are looking for wildlife, art, culture or scenery it is all within reach from this port of call. Find out underneath what there is to see and do in Juneau. This is the S. Franklink dock in Juneau. This dock, the cruise terminal dock and the tender pier are right in town. Only if your ships docks at the AJ dock you will need a shuttle service to get into town. You will find a visitors information centre at the cruise terminal dock right in the centre of town. Walk in for any kind of information about transportation, hiking of shopping. When it’s a busy day in Juneau one of the ships might have to tender. It will drop anchor and tender you to shore with its smaller lifeboats. The lifeboats will drop you off in the centre of town. There is public transportation available in Juneau. Pick up the city bus in town. Keep in mind the tourist attractions are about 1 mile walk from the nearest bus stop. In town you will find several local tour operators that offer their excursions on the dock and in town. They are often cheaper than your ships excursions, but they don’t provide the same service that would expect from your ships shore excursions. 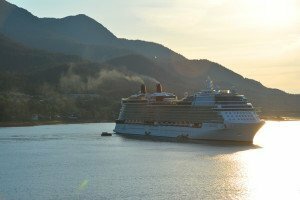 In Juneau there are about 5 docks available for cruise ships: S. Franklin Street dock, Intermediate Vessel Float, Cruise Ship Terminal, Alaska Steam Ship Dock and A.J. Dock. All of them are basically in front of the town centre and it is only a few minutes walk to the Main street, Franklin street and Boardwalk. The only exception is the A.J. Dock. This dock is about 20 minutes walk from town, but there is a local shuttle bus provided for a small fee. In town you will find lots of facilities for tourist. At the docks is the tourist information for any kind of information. 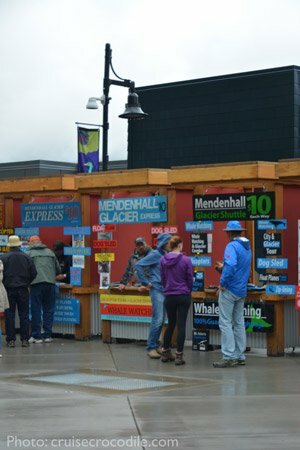 You will find booths that are selling shore excursions and shuttle busses to the Mendenhall glacier. Other than that you will get lots in between saloons and souvenir shops. 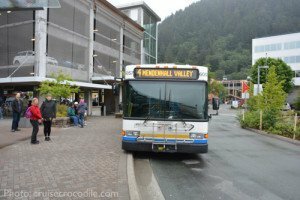 All over town and especially around the docks you will find there is a local shuttle bus offered to the Mendenhall Visitors Centre where you will have a good view over the glacier. The shuttle costs 20 dollars round trip per person. Buy the tickets directly at the local tour operators you will find on the dock. Compared to the cost of the Mendenhall shuttle bus it will be cheaper to take a taxi if your group is 4 persons or more. Although Juneau is a charming town we strongly feel you should get outside of the city border to get a true feel for Alaska. The town is spread on about 9 blocks and you’ll be threw it before you know it. There are many tours that are offerred in Juneau. Think about kayaking, biking, hiking, flight-seeing, gold panning you name it. Tours can be bought on board of your ship and shore side. There is more miles of trails than miles of road in Juneau. In fact, there is a total of 250 miles of trails, most starting within the city limits. Always visit the Visitors Centre first to check on the latest condition of the tracks and to pick up a map. The most popular hiking routes starting in the city of Juneau are the Perseverance trail and Mt. Robert trail. Find the information on these trails at the tourist information center in town. – What will the weather be like? No idea! That’s the best answer we can give you. We notice that even the weather forecast is wrong all the time and weather can change rapidly. Be prepared for sunshine and rain and you should be good. – Do I need a fishing license? Yes, only if you are 16 or older. You can purchase licenses and permits online. Visit the Alaska Department of Fish and Game website www. adding.alaska.gov for information about license. For those looking for a work out Mt. Roberts trail is one not to be missed. It is a 4,5 mile (one way) track with an elevation 3600 ft that will bring you to spectacular scenery. Find the trailhead on the map above. You can also find a short cut to the top. Simply take the Mt. Robbert tram in downtown which can take you straight to the top. Before starting this hike you should always visit the tourist information first for any news you should know about and for the hiking map. To reach the town of Juneau your ship will need to sail through the Gastineau Channel. Make sure to be on the outside deck to enjoy the scenery about an hour before arrival and an hour after departure. A city that can only be reached by sea, air or birth canal will rely on transportation other than cars. Float planes are the way to go in Juneau and they are also great for sightseeing. Consider taking a flight seeing tour over the Taku glacier, Mendenhall glacier or Glacier Bay. This truly is one of the best experiences you could ever treat yourself to. When shopping in Haines make sure to buy the products with this logo. This indicated the products has actually been made in Alaska. 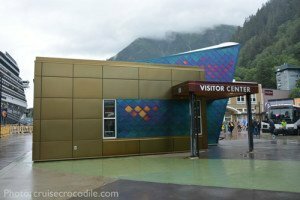 This is where you can witness the spawning process of the Alaska Salmon, eat some Alaska Salmon, try the touching tanks and see the hatchery. Find the Hatchery about 4 mile / 6 km north of town. Take a taxi or bus 3 or 4 to it. In Alaska you can find all five species of Alaska’s Pacific Salmon. They are King, Sockeye, Coho, Pink and Chum. Every year from August to October you will find the salmon find the very stream they were born to spawn and die. 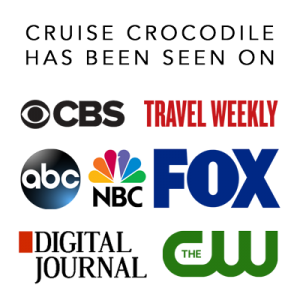 It is a phenomenal event that you cannot miss if your cruise is arriving in August or September. 13 miles out of town you will find the Mendenhall glacier. It is one of the most accessible glaciers on earth. At the visitors centre you will find exhibitions and educational programs about ecosystem, protections of fish and wildlife. There are also several walks to get you closer to the glacier or to some really nice waterfalls. Chose to visit the visitors centre for an hour or plan a whole day of hiking around the area. Visit the Mendenhall glacier by taxi or public transport. Mendenhall Visitors Centre This is the visitors centre you will find at the Mendenhall glacier. It has excellent exhibitions inside explaining what a glacier is and the life span of the Mendenhall glacier. Visit the visitors centre by excurion, glacier express bus or public bus. See description above. Helicopter landing on the Mendenhall glacier The mendenhall glacier is one of the most accessible glaciers in the world and it is not very often that you have to opportunity to actually land on a glacier and explore this massive pack of ice by foot. If you want to experience something unique we highly recommend an excursion by helicopter to the Mendenhall glacier. Patsy Ann is the “Official Greeter of Juneau, Alaska”. 50 years after she met her last ship this Bronze statue was created on the docks at Juneau so she could once again regain her status and Official Greeter of Juneau. The Mt Roberts tramway takes you straight from the dock to Mt. Roberts. Have a scenic walk here to several photo stops, see the Mt. Robert movie, visit the raptor centre or do some shopping. You might even want to leave the upper station and go hiking over the mountain tops where you will have beautiful views over the surrounding islands and mountain range. Alway be informed about the weather or anything unusual by the tourist information. Find the Mount Robert Tram right in town. 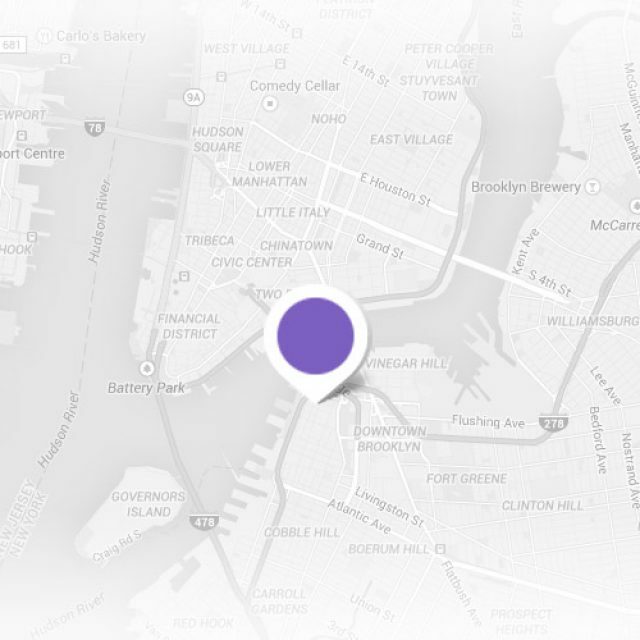 See map above for its exact location. Juneau is also gateway to the famous Tracy Arms. This is a fjord known for its dramatic sheer cliffs, waterfalls and some of Alaska’s largest ice bergs that just fell of the face of the North and South Sawyer glaciers. Book your tour to Tracy Arms through the ship or prearrange it online. This memorial is dedicated to the 53 Japanese Americans of Juneau who were unjustly taken from their homes at the start of World War II. In 1941 people of Japanese ancestry living on the west coast of the USA were removed and incarcerates in isolated government internment camps. The seniors at Juneau High School left an empty chair during their graduation ceremony for their absent, fellow student who should have been there. It is an important historical event of which the citizens of Juneau feel like it needs to be remembered. The famous preseverance trail is a 3 mile long (one-way) trail with an elevation of 700 feet. The trail starts in down town Juneau. See map above for the start of the trail. Perseverance is the name of a mine that used to be located here. Along the way you will see the remains of the mine, the Last Chance Mining Museum, the Exner Falls and Gold Creek. Visit the visitors information centre to check the latest update on the track and to pick up the hiking map. What started off as a small little shack on the pier selling king crab and chowder is now one of the most popular restaurants in town. It’s quite pricy, but well worth the experience. Find the new Tracy’s Crab shack on the pier at the cruise terminal. See map above for the exact location. The port of Juneau offers 5 different docking locations for cruise ships. Most of them are located in front of the city center. You simply walk of the pier and everything is there. 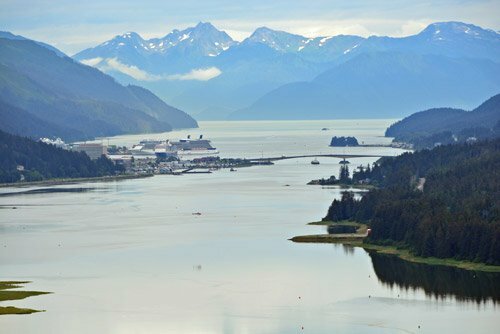 Read the full Juneau cruise port guide to read about the exceptions and things to see and do. Find all kinds of mining tools, machines and other artifacts here on display. Learn more about the mining industry in Juneau. How they were able to find gold, the efforts and techniques that were involved. You can even look for gold yourself. The gold creek is right at the doorstep of the museum. Buy everything you need at the museum and go gold panning yourself. You’ll most often find something, even though its only tiny gold flakes. Find the museum at about 30 minutes uphill walk from town. Follow the Perseverance trail. This is the oldest man-made attraction of Juneau. It is especially popular amongst the Americans that are looking for a fun and relaxed afternoon at the bar. Find the Red Dog Saloon right in town.